Kids play today is very different to generations past. Many would prefer to be on their digital devices than outside in the sunshine. There seems to be less tree-climbing, limited puddle-jumping, and definitely no fort-building in the bush. 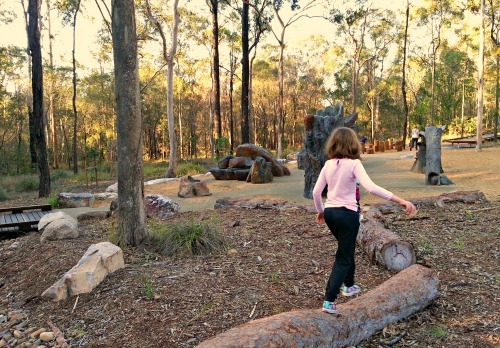 Brisbane City Council have just taken a huge step forward to 'rewild' kids with the opening of a different kind of play zone - the Karawatha Forest Nature Play Space. 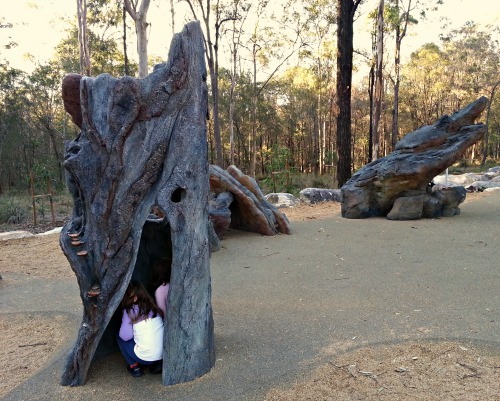 Recent upgrades to the Acacia Road section of Karawatha Forest Park now include a playground unlike most others. You won't find traditional metal monkey bars, plastic slippery slides, nor fiberglass rocking animals here. Instead you will find nature-based play structures, encouraging the type of play which involves kids taking risks, challenging themselves, getting dirty and appreciating the beauty of the natural world. The whole play area has been designed to work in with the natural environment. There are boulders and logs begging to be climbed, and soft grasses for swashing about in. Discovery trails follow purpose-built timber boardwalks and unstructured stepping stones. This is the type of playground in which little kids, big kids and parents can explore together. There is even a water play area here. 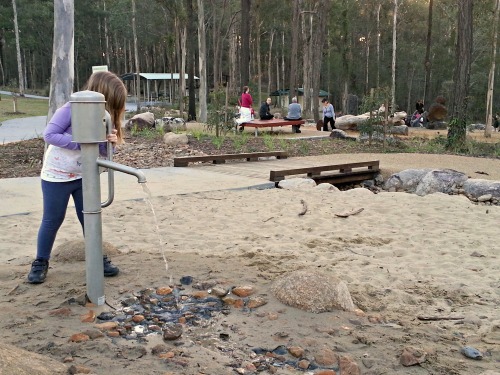 Kids can manually pump a large tap and divert the water around rocks or through sand troughs, down to a rocky 'dam'. Or they can enjoy the simple pleasure of playing with sand of varying textures. I thought that my kids might get bored of this area quickly, but I underestimated the power of imagination. A hollow log that had initially become a climbing challenge to conquer, then became a great spot for hide and seek. The kids enjoyed the increased physical challenge that comes with jumping over loose rocks without tipping over and scrambling across uneven logs. This was so much more appealing to them compared with walking across smooth metal balance beams. Artwork also features in the nature play space. 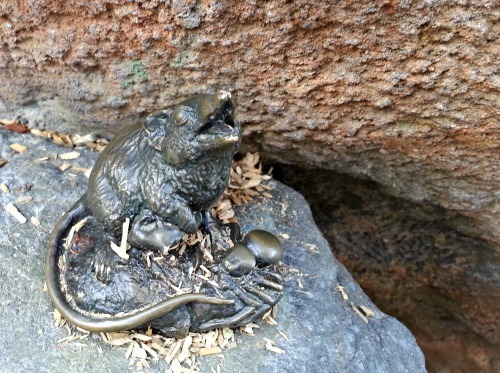 Look out for some cheeky creatures, in sculptural form, hiding within the park. Go on an artwork scavenger hunt - can you find them all? While you're in Karawatha Forest Park why not explore a little further. Tackle one of the many walking tracks. A map can be downloaded here. Pack a picnic to share on the large picnic lawn or under a shelter. Perhaps bring out your inner carnivore and take advantage of the free electric barbeques. Make sure that you also check out the newly opened Karawatha Forest Discovery Centre to learn a little more about this beautiful pocket of nature and how we can help preserve it. You can read the full Weekend Notes Review on the Discovery Centre here. 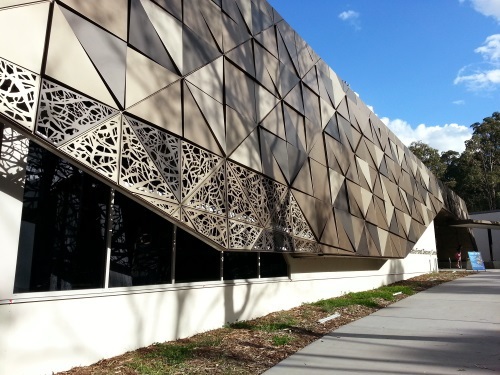 Inside you'll find a range of interactive learning activities suitable for kids of all ages. 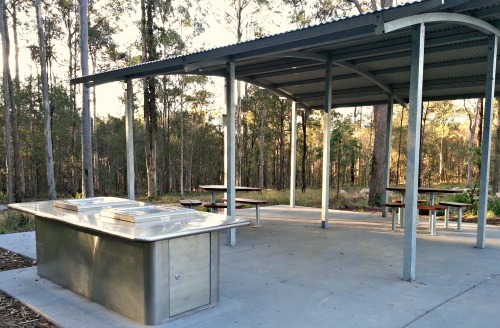 Gates at the Acacia Road entrance of Karawatha Forest Park are open from 6am-6pm daily. The Nature Play Space is wheelchair accessible. Toilet facilities are located close by. Ample seating has been provided, plus the large trees keep the area shaded. 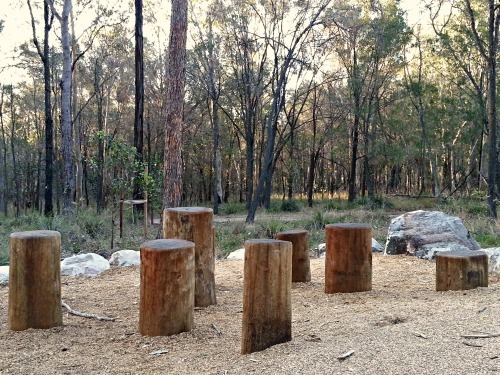 There is plenty of parking available, heaps of space to spread out, and loads of free-range fun to be had in the Karawatha Nature Play Space.